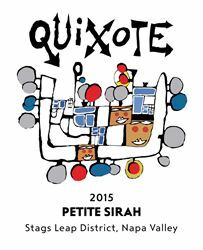 Quixote Winery in Napa Valley has been called “whimsical” and “eccentric.” To those who have experienced Quixote’s architecture and breathtaking surroundings in the golden hillsides of the Stags Leap District appellation, the 42-acre wine-producing property is a world all its own. Designed by the world-famous, free-spirited Austrian artist Friedensreich Hundertwasser, the winery is the only Hundertwasser building in the United States. The property is home to 29 acres of Cabernet Sauvignon, Petite Syrah, Malbec, Petit Verdot, and Cabernet Franc. The 100% estate wines come from our vineyard that is farmed organically by famed Napa vineyard manager Michael Wolf. The fruit is then handed over to consulting winemaker Aaron Pott, who strives to create the most balanced wines to be enjoyed now or over the next 15+ years. The estate beckons the wine collector…but a collector with a sense of humor and a free mind who isn’t afraid to trade straight lines and traditional ways of thinking for curved floors and complete immersion with nature. Today, visitors are welcomed by a tree-lined drive and enveloping branches of old oaks, a walkway through wild grasses and finally the iconic onion-shaped gold dome stretching into the sky. Tasting are conducted seated in our welcoming salon after the completion of our education tour of the winery and it's architecture. To join the wine club, visit www.QuixoteWinery.com. or call 707-944-2659. 2 complimentary ESTATE Tastings for all of our Napa neighbors available year-round on our "Local Days" of Monday thru Wednesday. We are by appointment, so calling ahead is recommended.